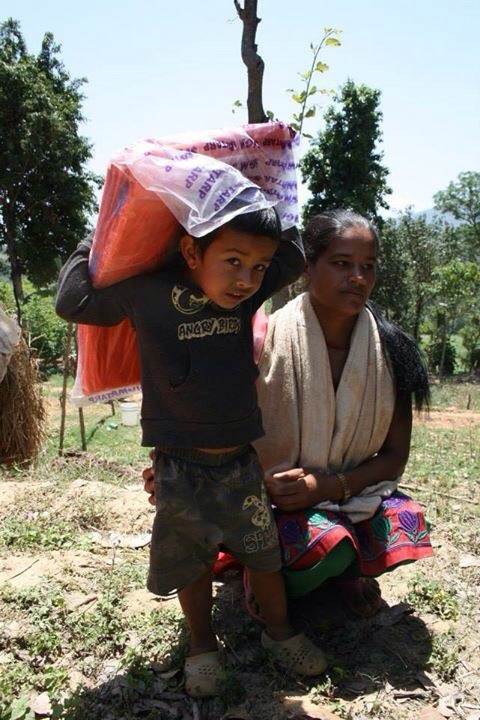 Cordaid’s partner Caritas Nepal has started emergency relief distribution in rural areas. In the Kavre district the Caritas Nepal team has distributed tarpaulins in three villages, reaching 200 families. The tarpaulins help to provide temporary shelter for those whose houses were destroyed by the earthquake. In the village of Panchkal 80 houses are reportedly damaged of which 20 are completely destroyed. Most of the villagers who have come to collect a tarpaulin are women. Many of the men from the village are working in the city or abroad. One of the victitms is Surmala Cholagai, a 26 year old woman. She came to collect a tarpaulin today accompanied by her son of 4. She was with him in the house where she lives with her father-in-law when the earthquake struck and the roof of the house collapsed. Trapped in the rubble, they waited until the shocks subsided, and the neighbours came to rescue them. The first few days after the quake the child remained terrified – he could not eat or sleep. Until today Surmala and her child have spent the nights sleeping under a flimsy plastic sheet. Pleased with the tarpaulin provided by Cordaid Nepal, she says they are ‘Godsent’, and hopes there will be one for all who no longer have a home to return to.